Air transport makes a decisive contribution to people’s individual mobility. Even long distances can be covered quickly and safely with air travel, which is why airplanes are indispensable in private and business travel. Air transport enables millions of people to engage in cultural exchange, and it also boosts the tourism industry, which is a major economic factor both in Germany and in the tourist destination countries. If you travel abroad, be it for private or professional reasons, the plane is the first choice: around 40 percent of all private and business trips from Germany to Europe or the rest of the world are made by air. The offer of air services is attractive: the 2018 summer flight schedule offered passengers a total of 350 international destinations from German airports without changing planes. Around 15,000 aircraft depart from German airports every week to take private and business travelers to their destinations abroad. 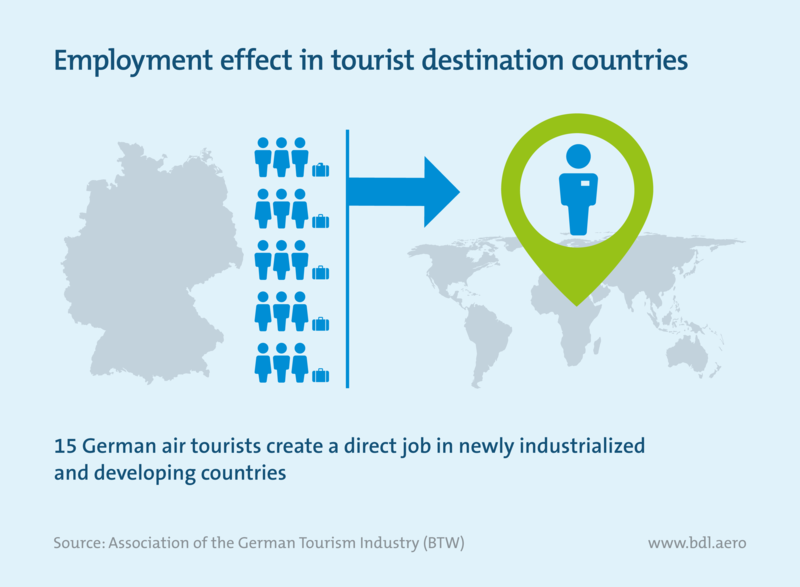 Not only does this create employment in the German aviation industry but also in the tourist destination countries, because spending by German tourists represents an important source of income for these countries. 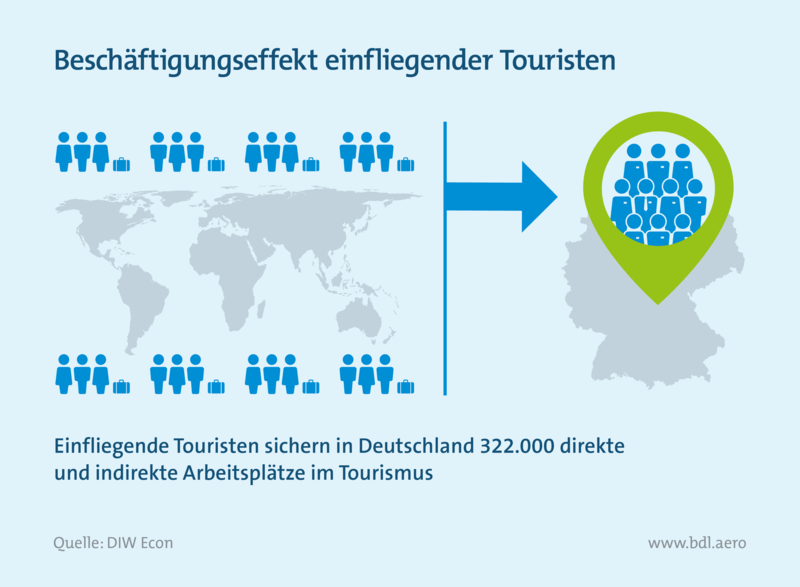 A study by the Federal Association of the German Tourism Industry (BTW), co-financed by the German Federal Ministry for Economic Cooperation and Development (BMZ), concludes that consumer spending by German tourists secures 740,000 direct jobs in newly industrialized and developing countries. If converted, this means about 15 German tourists create a job there. In addition, there are further jobs created by spending by companies in the target country, such as craft businesses, construction companies and retailers. Guests from abroad mainly choose airplanes for private or business travel to Germany. For the vast majority of people in the world, air travel is the only way to travel to Germany, as it is the only means of transport that can cover long distances in a short time. 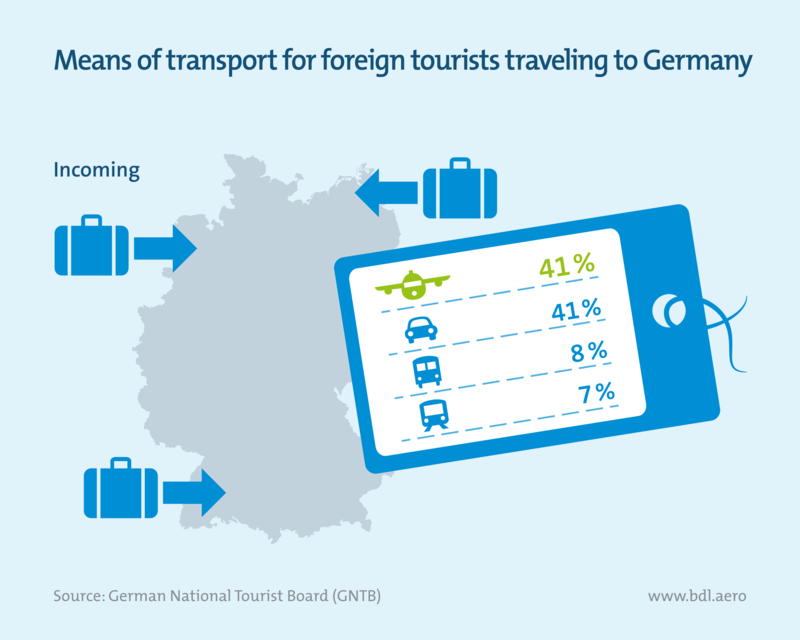 Regular surveys conducted by the German National Tourist Board (GNTB) show that around four out of ten foreign guests arrive in Germany by air. 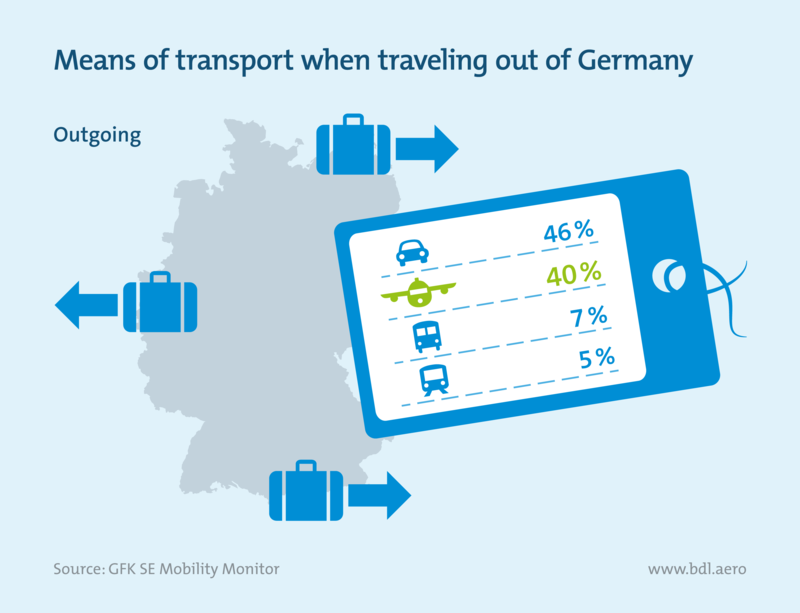 And when it comes to overseas tourists, as many as 97 percent travel to Germany by plane. The expenses incurred by guests flying to Germany secure jobs not only in the aviation industry but far beyond it. Foreign air tourists spend about €13.5 billion annually in Germany. According to the German Institute for Economic Research DIW Econ, the jobs of more than 300,000 women and men working, for example, in German hotels, restaurants and cultural institutions depend on this. In addition to these direct employment effects, there are also indirect effects, because the employees of hotels, restaurants, etc. in turn spend money, for example in retail.